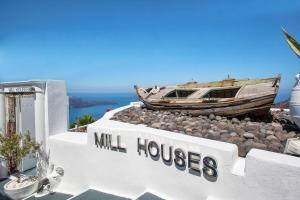 The Mill Houses Elegant Suites, located in the village of Firostefani, is a completely white accommodation with a pool and rooms with a porch overlooking the Santorini Volcano. 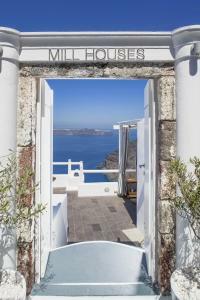 Open-plan bedroom with dining table, kitchenette and veranda overlooking the Aegean. 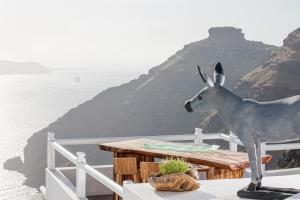 Open-plan bedroom with dining table, kitchenette and veranda overlooking the Aegean Sea. This king-size bedroom features a living area with kitchen equipment and a veranda with lounge overlooking the Aegean Sea. This king-size bedroom features a living area with kitchen equipment, an outdoor hot tub, and a private veranda with lounge overlooking the Aegean Sea. 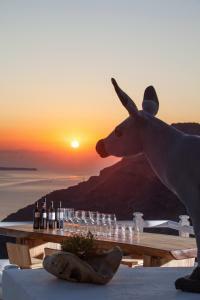 It has a living area with a kitchenette, a separate bedroom, an outdoor hot tub and a private veranda overlooking the Aegean Sea.